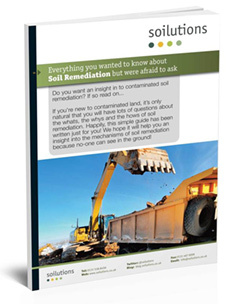 How do you Stabilise Contaminated Soil? How do you Stabilise contaminated soil? Well first lets backtrack a bit to explain what we mean by Stabilisation. It is a catch all term for a soil remediation technique which binds a contaminant within the soil or another matrix to prevent it’s movement. Rather than other remedial techniques which are focussed on the removal of a contaminant or it’s destruction by chemical or biological degradation, stabilisation breaks the Source – Receptor pathway by immobilising the contaminant within the soil. It’s worth mentioning that what we’re discussing is a stabilisation specifically targeted at remediation of contamination and not stabilisation to structurally improve the ground for engineering purposes. Some of the techniques are similar and often a by product of a contaminated soil stabilisation will be a structural improvement but it’s best not to assume this if your building design relies upon it. Stabilisation falls into two broad categories, Solidification and Stabilisation, a full explanation can be found here but in brief Solidification is a physical binding of the contaminant while Stabilisation is a chemical binding to an additive, or within the soil by changing the soils’ chemical properties. The choice of technique is largely dependant upon the contaminant, in conjunction with other project specific factors such as time scale, budget, remedial target levels and space on site. Solidification with a binder such as cement will be highly effective for a host of contaminants particularly Asbestos and some metals and organic contaminants. The technique is much like it sounds, add a binding agent or agents in the correct ratio with your contaminated soil and mix thoroughly, leave to cure for the required length of time and voila a solid block. A note of caution must be raised here regarding the choice of binding agent. Most cement works at quite high pH and pH is one of the crucial factors in the mobility of many contaminants in the environment. The addition of a high pH lime or cement mixture could well have the effect of making your contamination issues worse by mobilising things so that although the total concentration remains unaltered the contamination actually becomes more available to receptors. Stabilisation by chemically altering the contaminant to a less mobile form and/or binding to an additive is particularly effective with some contaminants and can be a good way to treat contaminants which respond poorly to a solidification process. This methodology relies upon either altering the prevailing conditions in the soil to effect a chemical reaction or introducing a material which the contaminants will preferentially bind to, for this reason it’s often more specific in it’s targets than a solidification treatment. Again the application is reliant upon a thorough mixing of the contaminants and your additives. Stabilisation can be carried out as either ex-situ or in-situ treatments, effective mixing is more difficult in-situ but it can be done very successfully with the right equipment. The tricky bit in any stabilisation is getting your mix correct and that’s where you’ll need to talk to an expert and carry out a treatability study. There is no one size fits all solution here, good chemical data, experience and healthy margins on the proportion of reagents used all improve the chances that a treatment will be effective but there is no substitute for a treatability study. On a large project investing some money and several months in a comprehensive trial will almost certainly save money on the project as a whole. On a smaller project the expense may be more difficult to justify but it will certainly add a level of certainty which could otherwise be absent. If you have a specific site or problem in mind and want to know more give us a call. Ya, Its a great idea, Because soil stabilisation is a great method for improves the engineering properties of soil.